How to > How to rip Blu-ray to MKV with DTS 5.1 for all audio streams? If you want to rip commercial Blu-ray Discs and DVDs and with DTS 5.1 audio output, then Pavtube ByteCopy must be an ideal solution for you. The software allows for backing up commercial copy-protected Blu-ray Disc or DVD movies into free MKV files with desired HD video quality, audio streams and subtitles. You can have DTS audio either by copying DTS-5.1 audio from original audio tracks or by converting the Dolby TrueHD, AC3, LPCM, PCM into DTS encoded audio with 6 channels. Why choose Pavtube ByteCopy to rip Blu-ray Disc? Pavtube ByteCopy preserves all video and audio tracks, including HD audio (TrueHD, DTS-MA, DTS, AC3, LPCM, PCM). Multiple subtitles can be attained. Pavtube ByteCopy can also convert HD audio (TrueHD, DTS-MA) to more acceptable AC-3 and DTS 5.1 audio when it necessary. Pavtube ByteCopy shrinks Blu-ray contents to smaller file size when you need. There is free trial version for you to try out. You may download a trial of Pavtube ByteCopy and follow the short guide below to rip Blu-ray to MKV with DTS 5.1 audio and lossless video. 1. Run Pavtube ByteCopy, and click “Load Disc” button to import movie files from copy-protected Blu-ray Disc/DVD. 2. Once the movie source is opened you will see its contents as a tree structure. For each Title you can click the plus sign to view detailed information such as video codec, size, audio codec, language, subtitles and so on. You can select which titles you want to save and what tracks to keep in each title. Uncheck the audios and subtitles you don’t like, and the others will be reserved. 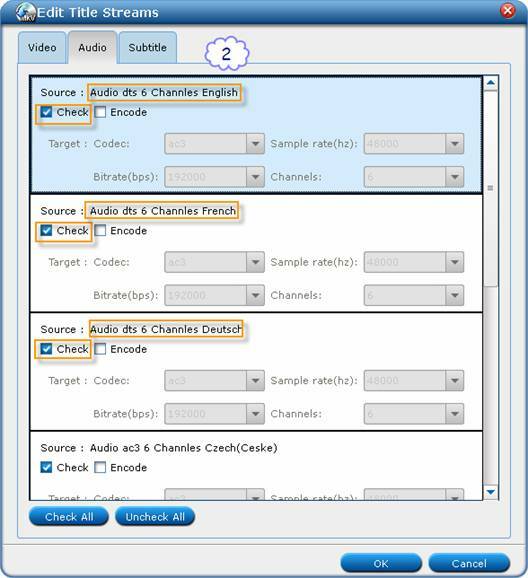 More than one audio stream can be included in final file. When a Title is selected, you can click the “Edit Title” button, switch to “Audio” tab to set DTS 5.1 audio output. If the audio stream is DTS 6 channels, just check the stream so that the ByteCopy software will copy the stream without transcoding. If the audio stream is AC3/TrueHD encoded, you can set output audio codec to DTS, and channels to 6. In this way you rip Blu-ray Disc to MKV with DTS 5.1 audio for all Titles. Tip: To ensure lossless video quality output, just switch to Video tab, and uncheck the “Encode” box under video stream. 3. Back to the main interface, and click the “Convert” button to ripping Blu-ray to MKV with DTS 5.1 audio and lossless video. Selected audio tracks will be copied/encoded into MKV file with video streams and subtitles. By now you have ripped Blu-ray movie into MKV file with DTS 5.1 audio sealed into a file playable on a typical hard disk media player. How to use Pavtube ByteCopy software? How to enjoy Blu-ray movies on HDTV with WD TV Live Plus HD Media Player? Blu-ray ripping- how to keep Dolby Digital 5.1/Dolby TrueHD 7.1 audio?